Unveiling restored King Ramses II colossus - Egypt Today. CAIRO – 21 April 2018: Minister of Antiquities Khaled El-Enany and Luxor Governor Mohamed Badr visited Luxor Temple on Saturday to unveil the colossus of King Ramses II after restoration. 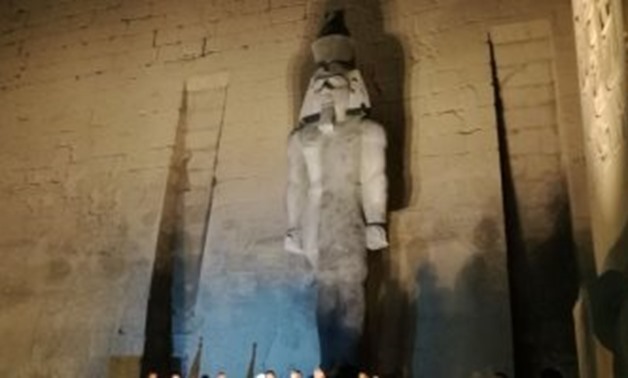 Mostafa El Waziri, secretary general of the Supreme Council of Antiquities, explained that the colossus previously decorated the façade of Luxor Temple, but a huge earthquake that had occurred led to its collapse. Waziri added that the statue was found damaged into 14 pieces of different sizes. The largest two pieces were the head of the statue and the base, representing 40 percent of the colossus. The colossus, which weighs 65 tons at a height of 11.7 meters, is carved of black granite. It depicts Ramses II standing wearing the double crown, his left leg in front of him. Waziri explained that the procedures of restoration and reconstruction of the colossus took about six months. The restoration was executed in collaboration with the Armed Forces Engineering Authority and Luxor governorate, which provided the required restoration material. This colossus was first uncovered during excavation works carried out by Mohamed Abdel Kader from 1958 to 1960 and is considered the second to be restored by the Ministry of Antiquities, as the first was completed last year. The unveiling of this colossus comes as a part of Ministry of Antiquities' celebrations for World Heritage Day. Before unveiling the colossus, Enany and Badr launched a new display of 186 artifacts at Luxor Museum after the transfer of 122 artifacts from the King Tutankhamun collection to the Grand Egyptian Museum in Giza. The 186 artifacts were recently discovered by an Egyptian archaeological mission at the Draa Abul Naga necropolis on Luxor's west bank. The collection contains ushabti figurines, painted mummy masks, anthropoid sarcophagi jewelry and a beautifully carved statuette of Isis Nefret, the singer of the god Amun.